Ben & Jerry's annouced today that they will not be reducing the size of their ice cream pints like Häagen-Dazs has so greedily decided to do. Thomas: Häagen-Dazs is reducing their pint size to 14 ounces but Ben & Jerry's isn't. 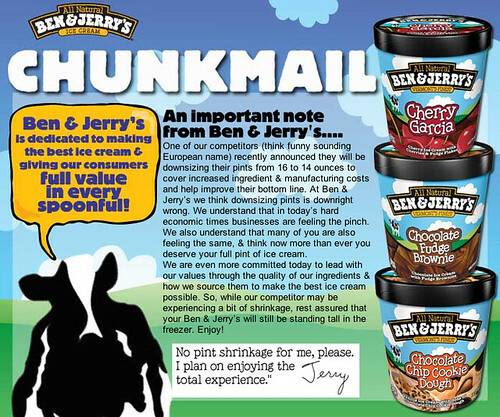 Me: Did you get that email from Ben & Jerry's? Me: My email wouldn't open a couple of minutes ago or else I would have scooped you! HAHAHA.